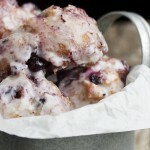 Delicious fresh blueberry fritters, with no yeast required. Best eaten on the day they are made, but they do freeze well. For the fritters: Combine the flour, sugar, baking powder, salt and cinnamon in a large bowl. Whisk to combine. In a medium bowl, combine the eggs, milk, vanilla and melted/slightly cooled butter. Whisk to combine. Make a well in the dry ingredients and add the wet ingredients. Stir just until combined. Add the blueberries and fold in. You'll want lots of blueberries, so add until the dough is well spotted with fruit. You almost can't have too many blueberries! *Tips: Have a cooling rack ready, set over a baking sheet. For deep frying, use a heavy, deep pot if you don't have a deep fryer. Have a lid handy, just in case. You'll need 2-3 inches of oil. If you have a thermometer, heat oil to 375° F. Without a thermometer, test oil heat by dropping a bit of batter in. It should float, sizzle immediately, and turn golden within a minute or so. In a heavy, deep pot, heat oil to 375° F. Drop fritters by the spoonful in to hot oil. Cook until underside is deep golden brown. Flip over and cook the other side. Remove to a cooling rack set on top of a baking sheet. Continue until all fritters are cooked. While fritters are cooling, prepare the glaze. Add the icing sugar, corn syrup, salt and vanilla in a large bowl. Set aside. In a small saucepan, bring the water and white granulated sugar to a boil over high heat then reduce heat to medium and simmer for 1 minute. Add this mixture to the bowl with the icing sugar and whisk until all the sugar and has been incorporated and the mixture is smooth. Dip cooled fritters in glaze or drizzle/brush glaze over and return to cooling rack set over a baking sheet to catch any drips. Allow glaze to set and enjoy! These fritters are best on the day they are cooked. They are still tasty the second day, but they will start to lose their crunch.